For her first show at the gallery, Berenice Olmedo (b. 1987, Oaxaca, MX) presents a new body of work that takes its critique and its form through the concept of the prosthesis. These prostheses are not seen singularly as representations of disability, but as a human condition that may be lensed through the architectures by which the object finds itself in: where such institutions surrounding an object provide themselves as a prosthesis through which the work may be seen instead as the conditions of the work, and rather than solely an object for aesthetic or conceptual contemplation. As one central focus of the exhibition, the work Olga (2018), demonstrates this disfunction of governance. Composed of a pair of prosthetic legs belonging to a child, and attached by invisible wire to a motor, the legs are made animate and given ability to attempt at standing and walking. In its attempts to attain a standing straight position and posture, it increasingly appears to undermine the operations and conditions that are made to discipline the body and which have kept verticality as its main concept. These words, verticality and condition, are most important because while the sculpture lifts itself and motions to stand, its body wavers and fails successively each time—finding itself continually falling to the floor. 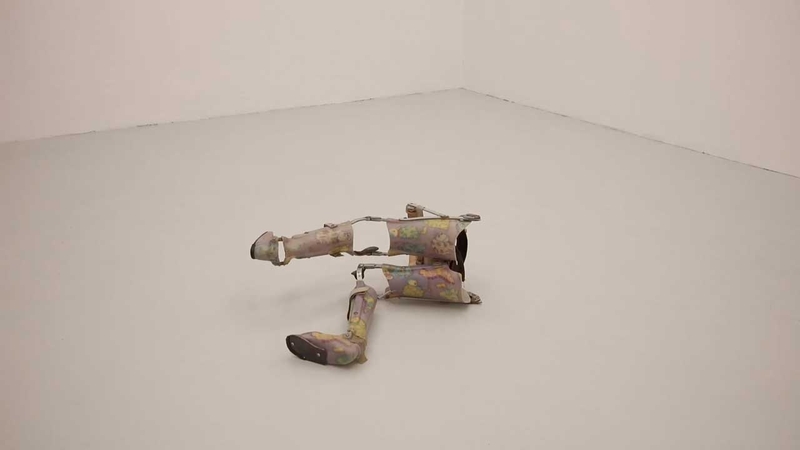 Thus, as a central thesis to the exhibition, the work poses the question as to when exactly a prosthesis or part of the body may be deemed useless and irreparable. While the works may appear as abject and culled from disuse, they are regardless in a shifting state between possible utility and ineptness, a state that could put at stake all the processes that give the body its own order while also disturbing its identity. For Olmedo the condition of the work is one that is equally present in the marginalised communities of México as much as it is present in the global communities that are consumed in perpetual inability and disfunction—often left as by-products from crisis and the failure of larger institutions to rehabilitate. Instead, as Olmedo asks, if the human condition is in aims to be a prosthetic being, how does one then find the same orthopaedics in the processes of art? 1 Sloterdijk, Peter. You Must Change Your Life: On Anthropotechnics, trans. Wieland Hoban. (United Kingdom: Published by Polity Press, 2013). p. 57. 2 Hayles, N. Katherine. How We Became Posthuman: Virtual Bodies in Cybernetics, Literature, and Informatics. (Chicago: University of Chicago Press, 1999). pp. 2-3.